Repeat: 13 1/2" vert. alternating , 26 1/2" horiz. Fabric Cost : $16.95 / yard Qty. Fabric Cost : $18.95 / yard Qty. A fabric that conveys the love for the game is hard to do and the Fairway fabric is not only reflecting a classic, time enduring game, but the passion behind it. This fabric reflects a classic period in American golfing, which began to become very popular in the States at the end of the 19th century. 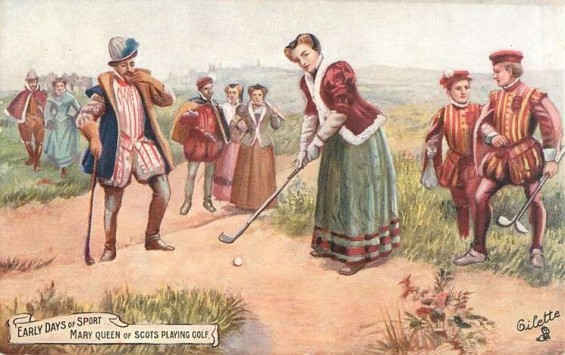 Known as the Victorian era, golfers were then as exuberant as today’s participants although probably not as well dressed for the game. 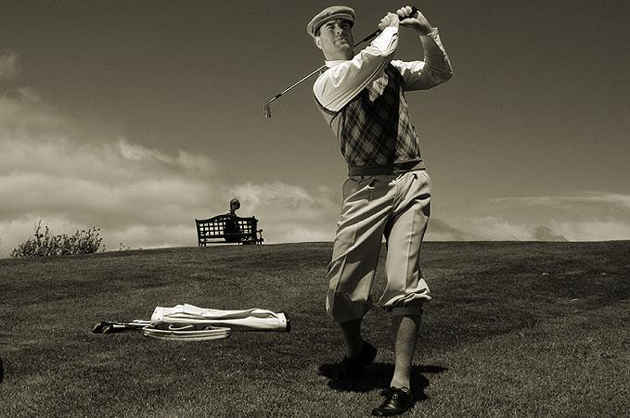 After 1900, men’s trousers began to lengthen and this was reflected in golfing outfits with trousers replacing the short cuffed pant with heavy long socks that were the standard during through the 18th and 19th century in Europe(as well as kilts of course in Scotland). Then again, anything from a morning suit complete with top hat to gardening clothes generally was acceptable in the 1800’s. Men by the 20th century were stuffing their trousers into the top of their argyle fabric socks with a wide variety of tops although the argyle vest seems to show up in a lot of old vintage photos. And the poor women- required to wear their full outfits, sometimes including big hats and puffy sleeved, full length dresses as they trudged around the courses in stays and girdled to keep the 18 inch waist line in place! 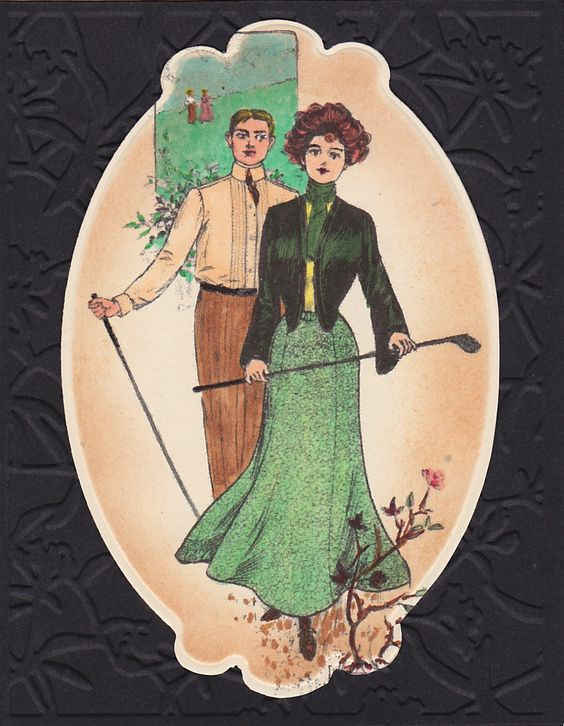 But they looked good and still do on this portrayal with the Fairway fabric, which correctly shows the enthusiasm for the sport in both sexes. There was no set ‘uniform’ for golfers, until the 20th century fashion and fabric industry created an image with polo shirts and golf hats with stores catering to golf lovers of all ages springing up, to aid in a player’s game, with comfortable, durable clothing. Today’s upholstery fabrics reflect both vintage and modern, traditional and novel, in a wide array of colors in an eclectic mix in most environments. We select our fabrics to blend with furniture finishes that change on occasion as tastes evolve and change but some colors are neutral enough to blend with any décor. Our Fairway golf fabric, that shows subtle browns, creams and greens on a light sage background gives an active outdoor feel to any room in any setting where your golf aficionado wants to put it. Its durability as a woven jacquard print that is able to handle long term use, makes it a good candidate for a clubhouse project or any other place where players may gather. It is thin enough to be useful with accessories such as pillows or drapes yet thick enough to hold up to 5000 rubs on a seat before showing signs of wear. 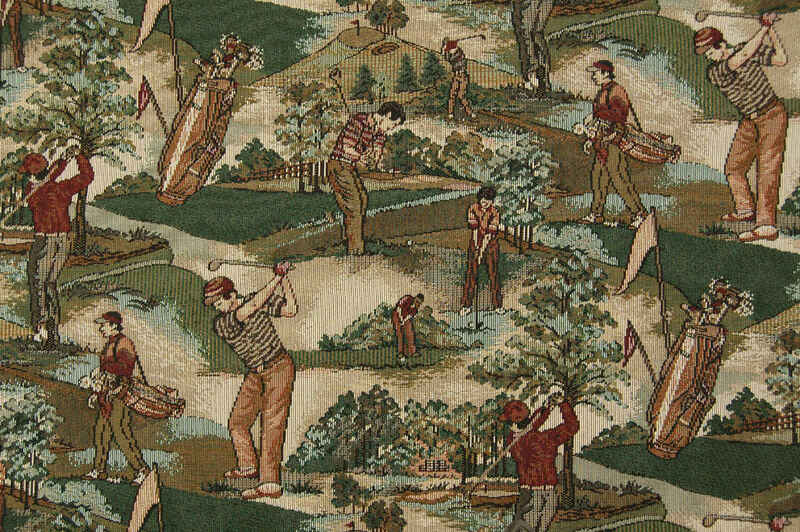 The Fairway fabric is one of our favorites as it tells a story of a time in the past that reflects today’s continued care free enjoyment in a timeless game that allows people to forget for a short time of the pressures of their day. Use your imagination to place it in your next project- you won’t regret it. 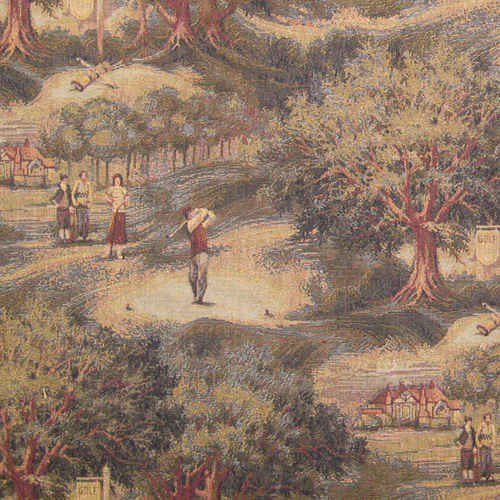 Our Glen Abbey Fabric captures the early history of Glen Abbey, world famous Canadian golf course, designed by Jack Nicklaus ( see story below for the history on this site). The land in that area is a scenic spot that has attracted the attention of many through the last one hundred years as a peaceful little slice of heaven. The emerald tones set with sage and green background with the blue tones reflecting the various ponds and lowlands are the perfect attitude for the scenes that depict different parts of this golf course that opened in 1973. This fabric can be described in make similar to Fairway as it is the same type of jacquard weave, capable of use for upholstery, pillows and drapery applications. 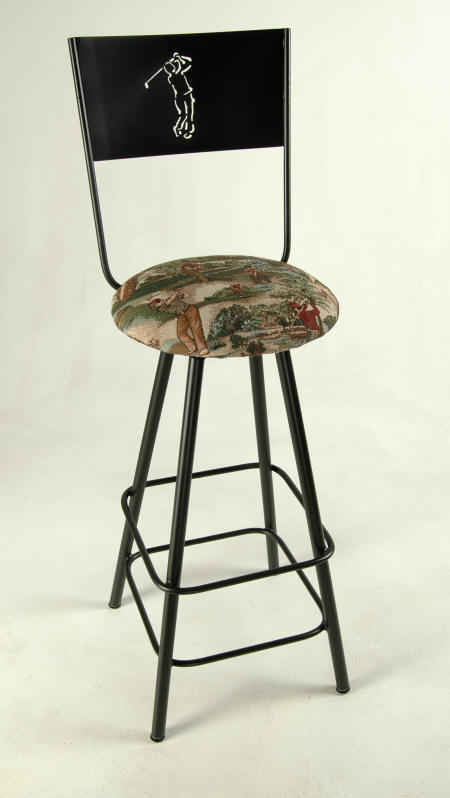 Here is an example of our Glen Abbey golf fabric used on a swivel bar stool done in a golf motif back. This bar stool is manufactured in America by Grace Collection in Rome Ga. If you follow Golf, you know the Glen Abbey golf course in Ontario, Canada, located about thirty minutes east of Toronto. It is a fairly young established golf course built in 1976 designed by Jack Nicklaus and quickly became the home for the Royal Canadian Golf Association and the Canadian Golf Hall of Fame. 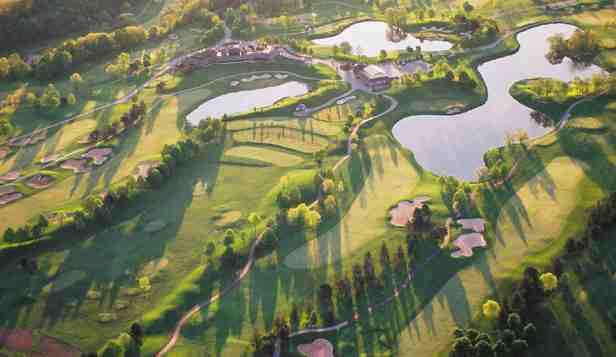 How did it get its name and why name it Glen Abbey? Golf and a monastery are the answer! 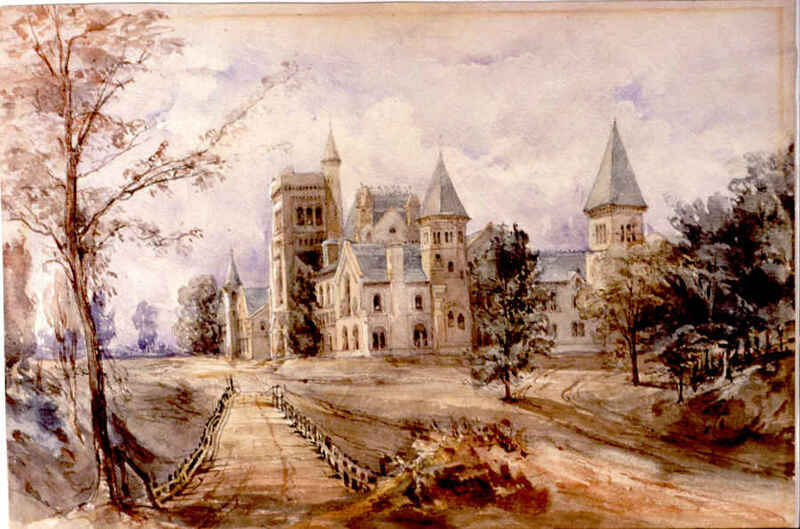 King’s College, which later became the University of Toronto, originally received the land in 1814, but Glen Abbey’s true history started about 350 miles north of it around the turn of the 20th century, in a mine located at Lake Larder. 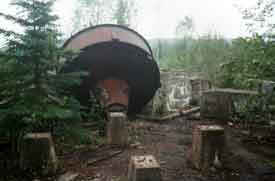 In 1903, silver was discovered in Northern Ontario and this triggered a massive search for precious metals in the area. 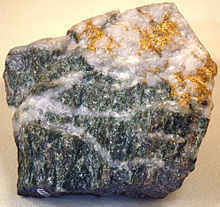 Around Lake Larder, a small amount of gold was found and by 1907, a full- fledged gold rush had developed with three thousand miners descending on it. 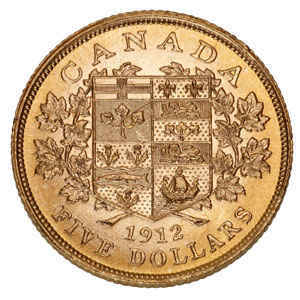 The initial mining attempts produced very little, although the first official Canadian gold coins were minted from the findings, and the site was virtually abandoned by 1911. However attempts to locate the right vein continued and, by 1921, two very large gold mines were made operational and were successfully mined for eight years. In 1929, with the Great Depression beginning, the mine owners were deep in debt from rapid expansion and sold the mines now consolidated into one mine to two partners. One of these men was Andre Dorfman, who already was invested in successful cobalt and silver operations between King’s College and the Lake Larder area. By 1935, with the mines in full production, Mr. Dorfman began to look for the perfect home and found it on the King’s College property. 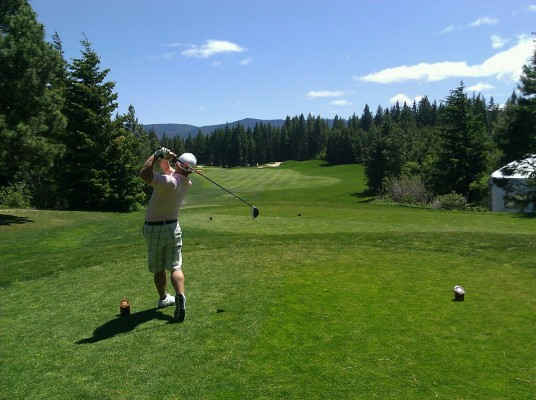 Possibly he was then able to follow his other passion in life-golf, or he just found peace among the glens and forests. He purchased 350 acres from the College and built a stone mansion that he named Ra-Dor Mansion. The property was then bought in 1952 by a group of Jesuit monks who used the mansion as a monastery and a place of retreat for the public for ten years before it was bought and changed into the Upper Canada Country Club and a proper golf course established there in 1963. 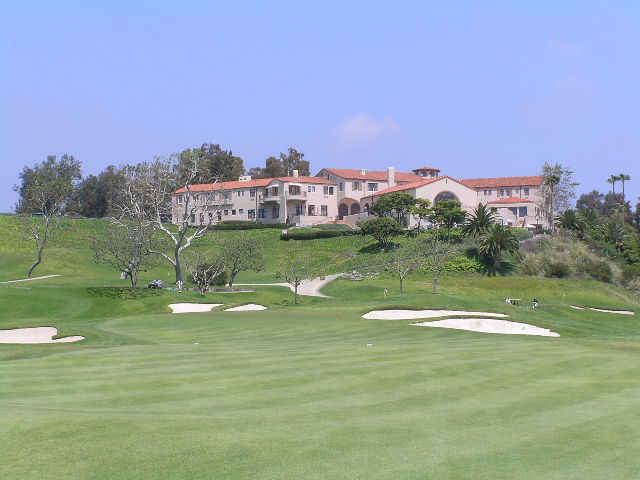 The stone mansion probably received its moniker of “Golf Mansion” during this time. So where did the name Glen Abbey come from? When this last course was created, in respect to the stone mansion which still stands today on the edge of the course, the name Glen Abbey was selected for one of the finest courses in golf history, designed by a pro for the pros, in commemoration for its earlier use as a monastery. 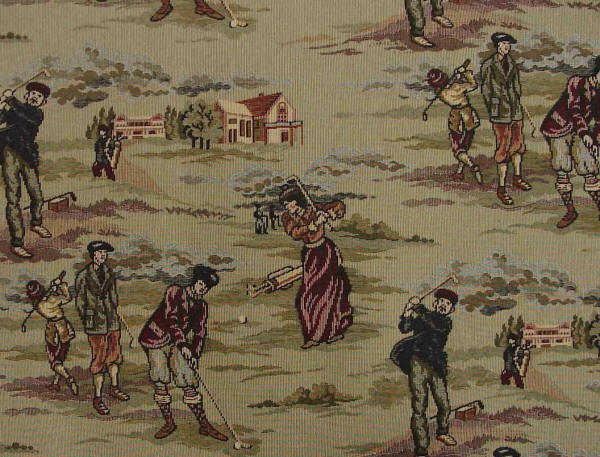 Our Glen Abbey golf fabric pattern captures the feel of this history golf course. Last year, it was announced that this course that has seen so much golf history made on it will be transformed into housing development. Sadly, tradition has not played a part in this particular location and Glen Abbey will someday be a dim memory but for now, it stands as a connection to the past that reflects what made Ontario great and continues to be the very heart of Canadian golf. What is the Advantage of cotton/polyester woven Jacquard Fabric? 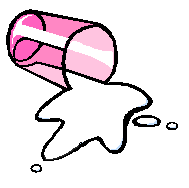 The beauty of having a cotton/polyester weave is the cleaning in case of a spill. The weave is tight enough to prevent complete saturation IF you get to the spill quickly to mop it up with a dry cloth, then in case of stain, treat quickly with a fabric stain remover. Like all fabrics, a good policy is to plan ahead and test your favorite stain remover in an inconspicuous spot in case the worst happens and you have to use it on a large, more obvious area. When you get your fabric, test it. Does it meet your standards? This is the ideal time to find out how it will hold up to your stain remover. 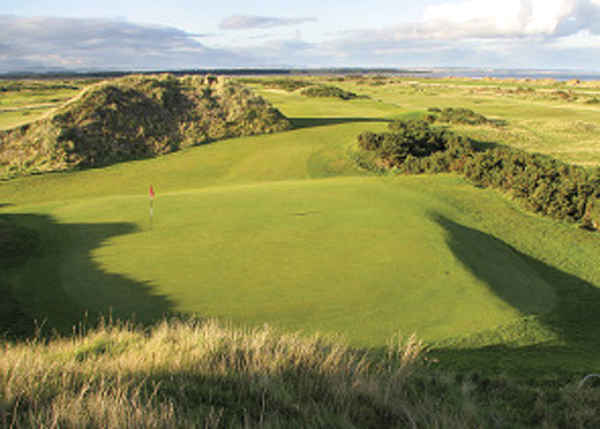 The sport of golf has emerged from history as one of the most popular sports in the world. 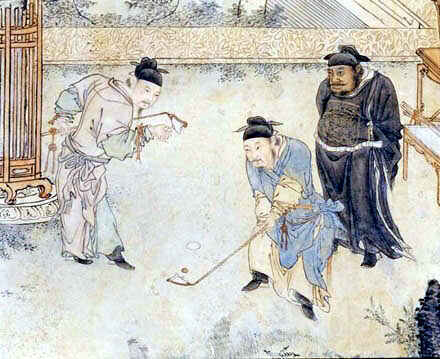 The credit is given to the Scots for the first games played over 18 holes but recorded instances of earlier games that were more rudimentary, such as one described in the Netherlands in 1297, do exist and several records exist that show prohibitions of the game of "Gowf" back as far back as the 1400’s in Scotland. 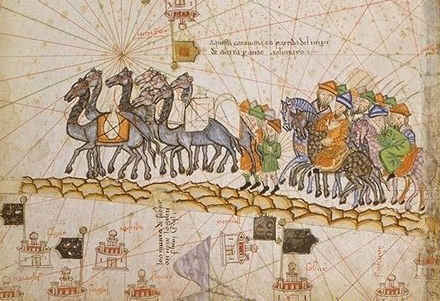 It is believed that Mongol traders may have introduced the game to ancient trade centers in Europe. 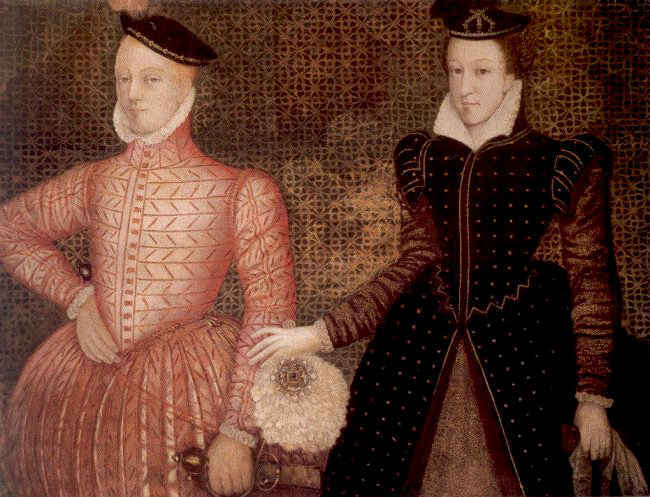 One of the most famous recordings of golf occurred with Mary, Queen of Scots, who was found and censured by her enemies for playing shortly after the demise of her second husband, ill-favored Henry Stuart known as Lord Darnley, who was murdered in 1567. Apparently, even she had discovered its relaxing qualities and the ability to remove even the most pressing problems from one’s mind as you walk the course and focus on your stroke. 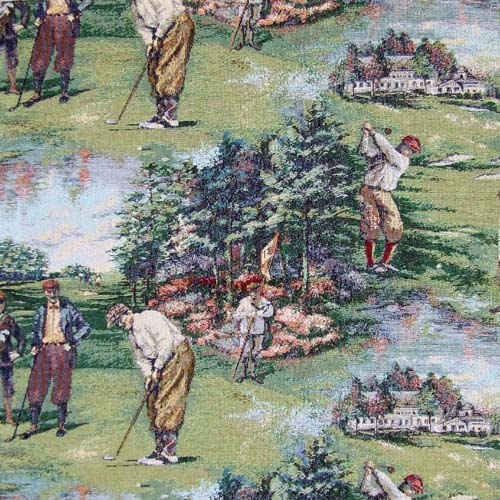 Our Fairway golf fabric pattern captures the golden Victorian era as this golf scene depicts.